Photo by George Strock/ LIFE magazine. That photo (which I paid Getty Images for the right to use) was followed by many more, all of which brought home the reality of war. Another special case involved war zone photography. Initially, U.S. military and civilian censors banned the publication of photos showing dead American soldiers or sailors. It was assumed that such images would be bad for civilian morale, and they would probably not bring the troops much cheer either. For twenty months after Pearl Harbor, not a single photo depicting a dead U.S. service member appeared in the news media. Much of the initiative for change came from the editors of Life magazine, which, with a circulation of more than 2.5 million a week,23 had emerged since its founding in 1936 as the nation’s premier showcase for photojournalism. Among its wartime staff were Margaret Bourke-White, Carl Mydans, and Robert Capa. With its large format and glossy paper, Life gave photos their greatest possible impact. In a 1942 advertisement for itself, Life expressed its philosophy: “Never has LIFE glossed over the horrors that stalk in the wake of the Axis aggression, but has shown war as it really is . . . stark, brutal, and devastating.” Even so, the censorship guidelines prevented showing dead GIs, so editors at Life and elsewhere pressed their case for greater candor. In mid-1943 the Roosevelt administration reversed its earlier policy, and in September officials began releasing the first of the somber photos. 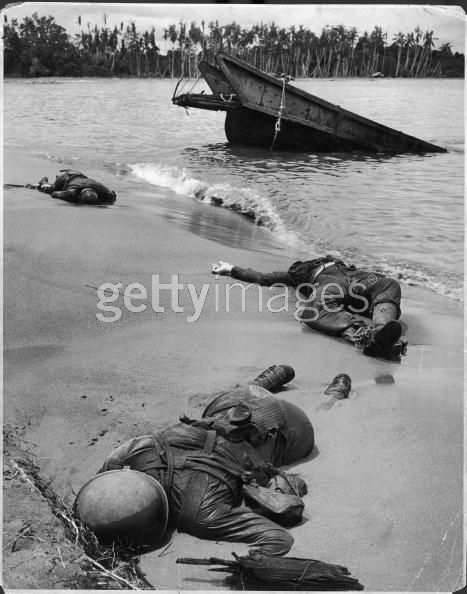 The most famous was the one printed in Life showing three dead soldiers lying where they had been shot on a beach in New Guinea. The photo, by George Strock, was a masterpiece of composition and understatement. The dead men’s faces were not visible, and their wounds were hidden as well. The editors and the military brass all worried about the public reaction, but they need not have: most letters to Life supported the decision, and there was no measurable drop-off in American support for the war. Ever since, readers on the home front have been given a closer and more realistic look at war. . .